As I mentioned on Saturday, my plan for the weekend was to begin making the blocks for my Winter Wonderland quilt. In order to make that happen, we needed to run an errand and do a little shopping before I sat down in the studio. With the shopping out of the way, my husband and I headed over to a small town near us that is chock full of antique stores. We wanted to drop off a couple of his vintage watches for restoration. While we were there, we thought we might as well visit our favorite antique furniture shop. It's just a small shop, but the owner always carries quality furniture, plus he has helped in the restoration/repair of several of our own pieces over the years. His little terrier, Charlie, is always there to greet us and likes to have his ball thrown so he can tear up and down the aisles in pursuit! 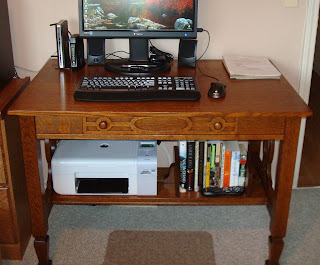 While I was busy with Charlie, my husband was looking over a gorgeous 1920's Mission, quarter-sawn oak library table. He asked me where we would put it in our house. Our house isn't that large and is already stuffed with furniture, so I didn't think it would be a good idea to try to cram in another piece. Ahhh....but I could really use a new desk and was planning to purchase one anyway once we move to our house in Eastern Washington. So look what came home with us! There is a shelf under the table that has built-in bookends which slide the entire length of the shelf! Now I must say, it wasn't easy getting the old desk out and the new one in! We have four flights of stairs that go from the garage to the front landing, from there to the main living area, from there to another landing and from there to the top floor! I had to completely unscrew the old desk and we moved it piece by piece down the winding stairs to the alley . At one point we had to take a couple of the heavy pieces out in a wheelbarrow! Then in order to get the new desk in, we had to carry it out through the garage, and clear around the corner to the front porch as it wouldn't make it through the garage entrance to the first landing! Whew! This was quite a feat for two people who are in shape, but no longer in their "prime"!! And in the spirit of recycling - I had barely gotten the FREE sign taped to the old desk when someone from a house behind us snatched it up! So with Saturday (and my body) shot, that left Sunday for quilting. I really did a number on myself with the thousand trips up and down the stairs, so all I managed to get done were two blocks. The first is 9" and the second is 12". These should go pretty fast, so I hope to have quite a few more done in the next week. As I was cutting these out, I noticed my cutting mat wasn't quite smooth under the fabric. When I investigated I found "lumps" under the area I make most of my cuts. I've never had this happen - have any of you? This could account for the fact that I seem to be a tad off in some of my cuts. I quickly turned it around and found a smoother surface, but it looks like a new mat is in order. By the way, Squash House Quilts will be getting a facelift soon! I'm currently working on a new background, so don't be surprised if you see a whole new look! Love the blocks and the beautiful table! I like your blocks. I have not had lumps on my mat just worn out places where I cut in the same place. So I just turn it around too. Now I have mat with measurements on both sides. Candace, what a nice desk. I love the shelf. And very nice blocks, too! Very pretty desk! I love that you put the other one out with a "free" sign on it--a la FlyLady. Someone out there is probably blessing you tonight! I have a beautiful desk that a very old man in our last neighborhood refurbished and refinished and I love it. (http://scrapsbystephanie.blogspot.com/2008/07/weekend-pasttime.html) if you'd like to see a picture. I don't know how old the desk is, but just loved the spinning wheel on the front and the odd-shaped handles on the drawers.